Join White in his adventure and defeat Obscurus, Lord of Darkness. 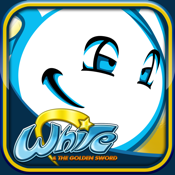 Use your Golden Sword and your three special abilities to travel through its fifteen new levels full of fantasy and color. Cupra Studios launches the adventure of a new character based on the classic concept of gaming platforms. Colorful designs and easy entertainment decorate the different levels through which the player must pass to complete the adventure. - Touch controls, accurate and comfortable. - Gameplay on platforms in two dimensions based on the classics of this famous genre. - Three special powers you must use cunning to overcome the various challenges. - Design of varied levels with more than one way to reach the end. - Hundreds of secrets waiting to be discovered. - Very easy to play but difficult to master. - Original soundtrack, fun and very catchy.